This assembly kit creates a robot whose movement can be programmed by the use of 3 types of special link put together to form a chain. The chain is pushed through the model by the chain gear, and the reader translates the different links into positions of the rear wheel, steering the robot. Attaching the chain ends to one another creates an ongoing cycle. Arms and head move along with the front wheel. Separately sold Educational Construction Series universal arm and plate parts can be added, thanks to compatible 3mm holes. 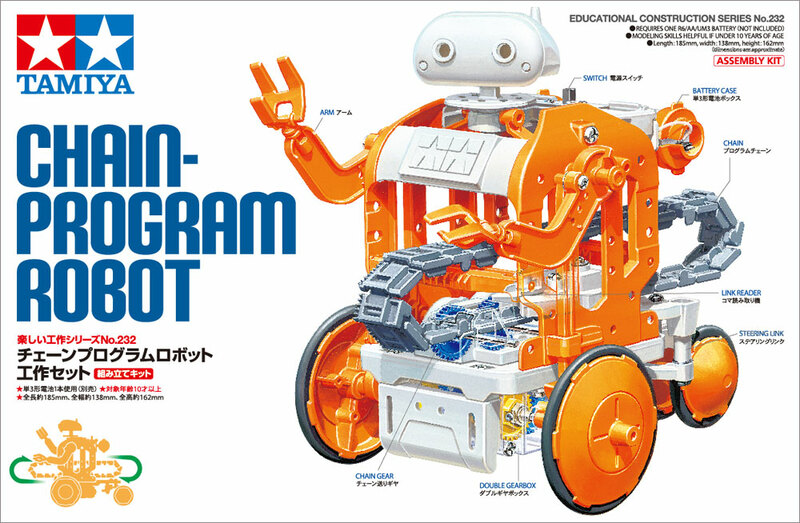 Likewise, the Chain-Program Robot can be paired with microcomputers and circuit boards for more advanced creations. Includes 2 motors and everything needed for easy snap-fit/screw-together assembly.★Length: 185mm, width: 138mm, height: 162mm (measurements are approximate). ★Requires one R6/AA/UM3 battery (not included). This entry was posted in Future Releases, Media on October 26, 2018 by admin.